Treat your guests to a comfortable wait with our Deep Tufted Leather Guest Chairs. Features pillow tufted seats and backs with extra deep foam cushions. Comfortable foam padded armrests and sturdy steel framework for extended chair life. 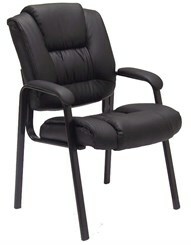 Upholstered in glove soft bonded leather upholstery for easy clean-up. Seat is 19-1/2"W x 20"D. Measure 25-1/2" from floor to top of armrest. Measures 24"W x 30"D x 39"H overall. Shpg. wt. 29 lbs. Ships unassembled. All components exceed ANSI/BIFMA commercial use requirements. Meets CA fire foam approval. 5-Year Limited Warranty. PRICE INCLUDES SHIPPING! IN STOCK!